Yoga is an ever-evolving mind-body practice that enhances the connection of our physical, mental, and spiritual selves as well as heightening our awareness of our connection to one another and all life. Yoga classes are an opportunity to focus on building strength, increasing flexibility, improving balance and creating mental discipline through a series of postures designed to challenge and invigorate. Breath-work and meditation techniques are practiced to reduce stress by calming the body and focusing the mind. A regular yoga practice can be a beneficial addition to your gym routine and an asset to all your fitness goals. 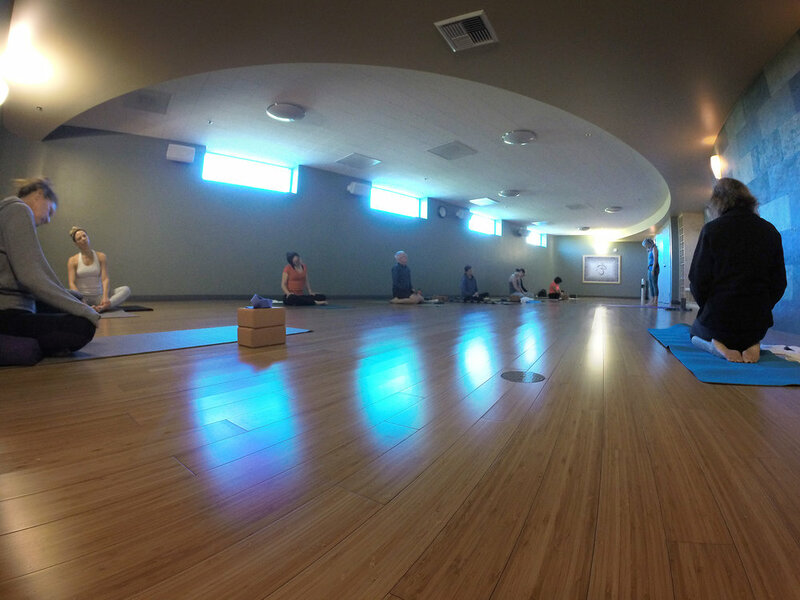 At HealthQuest, we offer a wide range of levels and styles of yoga. HQ teachers bring a blend of experience, training, and creativity to their classes designing their own sequences within a consistent framework of class level and style. A slower-paced asana class specifically designed for those recovering from injuries, living with physical challenges of any kind, pregnant or postpartum practitioners as well as those looking for a chance to slow down, quiet the mind and release stress and tension while moving the body through gentle yoga poses and transitions. The most gentle of our class offerings, this practice consists of a series of floor poses supported by the use of cushions, blocks, and other props. The poses are held for an extended time to allow the body to relax, the mind to calm, and tension to float away. Experience deep physical and emotional release in this practice. This practice is designed to help you sit longer, and more comfortably, in mediation by stretching connective tissue around the joints. A passive practice, Yin Yoga involves variations of seated and supine poses typically held for 3 to 5 minutes, accessing deeper layers of fascia. In the body, the relatively stiff connective tissues (tendons, ligaments, fascia) are yin, while the more mobile and pliable muscles and blood are yang. Some of the benefits of Yin yoga are: calming and balancing of the mind and body, regulating energy in the body, increasing mobility in the body. Pranalini is a unique fusion of Kundalini yoga and Pranayama. Gentle yoga postures are interspersed with dynamic breathing techniques coupled with spirited movement and rounds of Kumbhaka (breath retention) with Bandha (energy locks). The practice leaves students feeling refreshed, energized, vital and present. From first-timers to the seasoned yogi, this class will provide a comprehensive practice including pranayama (breathing techniques), meditation and physical exposure or asana. Pose modifications will be demonstrated for those with little to no yoga experience. A more vigorous ‘physical’ practice geared toward athletes and those wishing to enhance their physical performance and focus the mind. More challenging poses will be explored including arm balances and inversions. The class will bring you to your edge and is great for those ready to take their yoga to the next level safely. 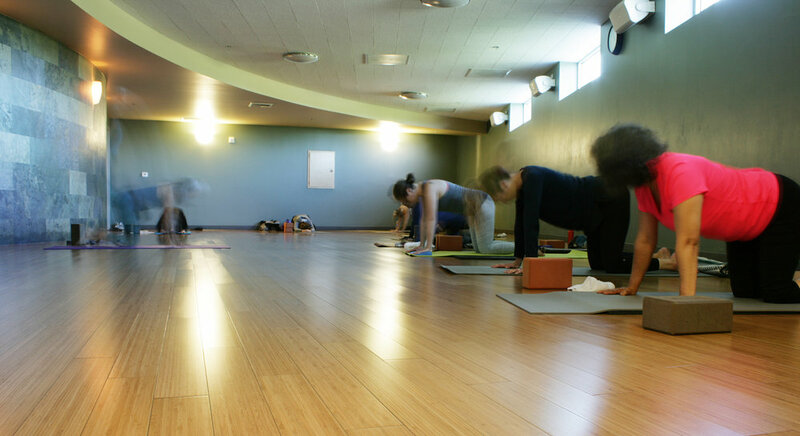 This is a "Vinyasa" style class with poses linked together and synchronized with the breath to create a dance-like flow. The class will move a bit more rapidly and is appropriate for those with some previous yoga experience. The practice is designed for those with limited mobility who would find getting down to the floor difficult or impossible. Gentle poses and breathwork are offered.